Decked out in matching blue t-shirts and led by the home-grown Local 1245 chorus, featuring Organizing Steward Arnaldo Lizarraga on drums and Staff Organizer Eileen Purcell on accordion, the IBEW 1245 Organizing Stewards and staff performed a rousing rendition of “Solidarity Forever” to gear up for this year’s Get-Out-The-Vote (GOTV) effort. Staff Organizer Fred Ross, who emceed the event, electrified the room with the chant: “Fired Up? Ready to Go!” Organizing Steward Nilda Garcia led off with a shout-out to the 14 teams of more than 100 Organizing Stewards, retirees and staff who will fan out to 12 Central Labor Councils in California and Nevada to work on local initiatives and support candidates who support working families. An additional three teams will head to the battleground states of Ohio, Pennsylvania and Arizona. What does GOTV mean? 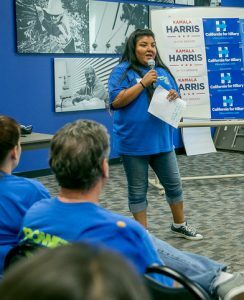 It means knocking on thousands of doors in dozens of districts, making phone calls from sun-up to sun-down, and doing whatever it takes to get out the vote for the candidates that have vowed to keep the interests of workers at the forefront of their policy-making decisions. It means recruiting co-workers, family and friends to join us in this critical election. And it means taking advantage of every opportunity — including worksite visits, brown bag lunches, house meetings and other special events — the help spread the word about voting this year. Elections matter. Whether it’s a City Council race, a Congressional seat or the highest office in the nation, the people that we elect have the power to enact policies that can drastically impact our lives, for better or worse. 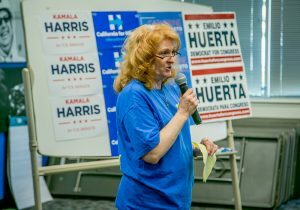 Seasoned Organizing Steward Rita Wiesshaar, an NV Energy retiree, detailed precisely what can happen when anti-worker candidates get voted into office. 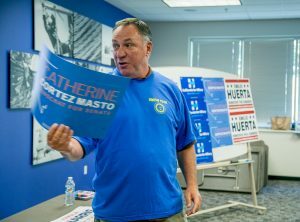 “If you want to know what’s really at stake during this election, just look at Nevada,” Wiesshaar said, and proceeded to explain how after a low voter turnout in the 2014 elections, a wave of corporate-backed lawmakers took over both houses of the Nevada Legislature and wasted no time dismantling critical workplace laws, including prevailing wage for school construction projects. In this election, 1245 Organizing Stewards and recruits will be fighting to take back their government and defeat Question 3 in Nevada. If passed, Question 3 would deregulate Nevada’s electric utility system, remove limits on what providers can charge and jeopardize our members’ job security. At the City of Vallejo, where 220 members of IBEW 1245 are in the midst of contentious contract negotiations with the Mayor and City Council, 1245 will help elect more labor-friendly officials to bargain with, which could result in a sorely needed change in the direction of those negotiations. Similarly, in the City of Lompoc, organizers are hitting the pavement to elect a pro-worker mayor and City Council. In the City of Sacramento, the union is fighting for Measure “B” to directly benefit the community and IBEW 1245 members at the Sacramento Regional Transit Authority (SRT). And in local areas across the map, Local 1245 is dedicated to electing lawmakers who support working families. 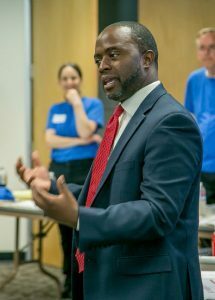 Assemblymember Tony Thurmond exemplifies the kind of lawmaker that’s worth working to elect. He grew up in a union household, spent a lot of time on the picket line, and has remained steadfastly committed to working families over the course of his career. He also recognizes and respects the importance of grassroots Get Out the Vote efforts like the one that Local 1245 is undertaking, which is why he took time out of his busy schedule to attend the union’s campaign kickoff. “Every time there’s a fight for what’s right, the people of Labor and the people of IBEW 1245 have been standing there in the gap, protecting the rights on working people,” Assemblymember Thurmond told the room full of Local 1245 activists. California Attorney General Kamala Harris is another lifelong champion for organized labor, and when she announced her decision to run for United States Senate, Local 1245 was one of the first groups to express support for her bid. Harris was unable to attend Local 1245’s kickoff in person, but she sent a video message along with her chief of staff, Chris Cunnie. Cunnie opened up his remarks by commending Local 1245 Business Manager Tom Dalzell for the union’s cutting-edge Organizing Steward program, as well as Dalzell’s commitment to leadership development and grassroots outreach. 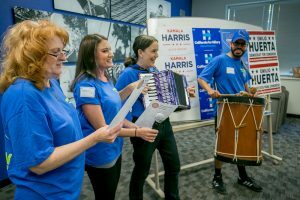 And to demonstrate just how much Attorney General Harris and her team support the union’s efforts, Cunnie announced that he would be going to Nevada to support Labor’s critical Get Out the Vote work in that all-important battleground state. 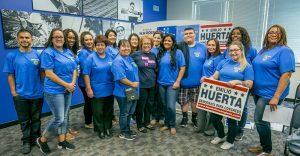 The action-packed kickoff concluded with a compelling speech from renowned labor leader Maria Elena Durazo, who currently serves as International Vice President of UNITE HERE, the hotel and hospitality workers’ union. There’s no question that politics can be polarizing, and talking about it can bring up all sorts of emotions. But for union members, elections are less about party affiliation and hot-button social issues, and more about supporting the candidates who will best represent the interests of workers. We need policymakers who we can count on to protect the critical workplace protections, life-changing benefits and quality contracts we’ve fought for, while ensuring that workers continue to have a voice in the future. The members left the rally energized, excited, and ready to get to work.